The most important thing to do during the first few months with your new dog is to spend absolutely every possible minute with it. Cockers are people lovers, it's as simple as that. Banish a Cocker to the back yard 23 hours a day and you're going to end up with a crazed Cocker. The second most important tip I can offer: give your dog lots of exercise every day. The more you can tire your puppy out, the less behavior problems you will have with it. Go for lots of walks, and teach it to chase and retrieve toys. Keep the pup in motion as much as possible, and his/her behavior will be so much better at home. An exhausted puppy causes no trouble! Keep your puppy within your sight at all times. Close doors or use baby gates in doorways to keep the puppy confined to the same room you are in. Do not let the puppy wander throughout the house unsupervised! If you can't watch the puppy, place it in the care of someone who can. If no one can watch the puppy, put it in a crate until you are able to watch it again. The first few months that you have the dog are extremely important for forming a special bond between you and the puppy. Take a week or two off from work so that you can spend some extra time with the puppy when you first get it. Let the puppy sleep in your bed, or in a crate on or next to your bed, so that the puppy feels like it is with you all night long. Puppies love to chew things, and will frequently try to chew you or your clothing. When this occurs, stick a chew toy in the puppy's mouth. There's no way to get a puppy to not chew things... the trick is to keep the puppy busy chewing things you WANT it to chew. Have a wide variety of chew toys available for the dog. Go to the pet store and buy about a dozen different chew toys in an assortment of shapes and textures. When buying toys for puppies, be sure to buy SMALL toys! You'll want some hard chew toys such as rawhide chews, as well as some soft chew toys such as plush "beanie-baby" type toys. I frequently get email from people who say their puppy is ignoring his toys but is always biting people instead. When I ask for an inventory or a picture of the dog's toys, the answer is usually clear: bad choice of dog toys! Buy a large variety of toys, and once you find what the dog likes, buy more that are similar but different to his favorites. Also, a word of caution about rawhide chew toys: these are fine as long as you are supervising, but don't leave rawhide toys with your dog for long periods. If the dog is given enough time, he will chew that rawhide toy in to small pieces. If he were to swallow one of those pieces, it could cause a major problem. Make sure your kids understand one important fact... there is no such thing as play fighting with a dog. The kids should be encouraged to play with the dog, but they must never ever play in such a way that the dog is encouraged to bite or do anything mean... or in a way that the dog would find scary. 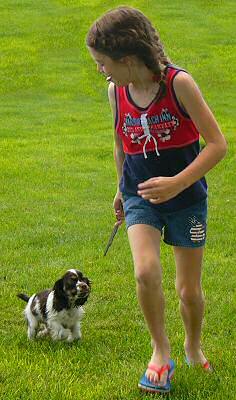 Your kids can very easily turn your dog mean if you let them just act like kids naturally do with a puppy. You've got to train your kids to treat the puppy softly and gently at all times, even at play time. Make sure everyone knows that "Tug-o-war" is not OK, too... it teaches the dog to work against you, and it's also a good way to mess up the dog's teeth. Use positive reinforcement, not negative. In other words, be full of praise for the puppy when he does good, but go easy on scolding him when he does bad. (Ladies, here's a marital tip: This technique works well on husbands, too.) Of course, you will occasionally need to communicate your unhappiness to the dog when it does something bad. Try to keep it simple and just use the word "NO!". You'd be amazed at how much a stern "NO!" and an unhappy look on your face can communicate. (Ladies, this technique will not be appreciated by your husband.) For situations where your puppy does not respond to "NO! ", keep a squirt gun or a squirt bottle on hand and just give a little squirt to let the puppy know when he's gone way over the line. (Another technique NOT recommended for use on husbands.) After a while, just the sight of the squirt gun will get your puppy to behave. 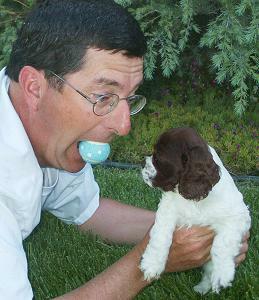 Teach your puppy to retrieve a tennis ball or other toy. 10 minutes of tennis ball retrieving in the evening will help keep your Cocker in good shape, and requires a lot less of your energy than taking the dog for a walk. (While the dog runs his tail off retrieving stuff, yours can be firmly planted in a chair.) If your dog is not a natural tennis ball chaser, it is a skill that can be taught. Start by tossing your dog's favorite toy a few feet away. Once you get your dog interested in retrieving it, gradually increase the distance that you throw it. Once the dog gets the hang of the game, it will retrieve just about anything you toss. Take your dog for long walks. The more exercise you give the dog, the more he will sleep the rest of the day. A bored dog with lots of excess energy and nothing to do will chew things and misbehave. A dog who is constantly exhausted from playing ball and going for walks will sleep, not misbehave. Teaching a puppy to walk on a leash can be difficult at first. They usually spend a lot of time fighting the leash the first few times you try to use one on them. But there's a simple trick that works amazingly well... it will make your puppy completely forget about the leash. The first few times you take your dog on a walk with a leash, have someone else walk another dog in front of you. It's something like getting a donkey to walk forward by dangling a carrot in front of his head... if you have someone walk an older dog a few steps in front of you and your puppy, your pup will spend all her energy trying to catch up to the other dog and will totally ignore the fact that she is wearing a leash. With a little planning, you can get your puppy to sleep when you want him to. For example, let's say you know your favorite TV show is coming on at 7 PM and you do not want the puppy demanding your attention at that time. Give the puppy some strenuous exercise about one hour prior to when you want her all pooped out. Getting the dog to retrieve tennis balls is good, but another technique that has always worked well for me is to get one of the kids to go out on the lawn and start running around. The puppy just naturally runs right along with. It only takes about ten minutes of "puppy chasing the kid" to poop out the pup. It might temporarily get her all hyped up, but about an hour later she'll be sleeping like a baby. It's good for your kids, too! Feed your puppy a good dry commercial dog food. 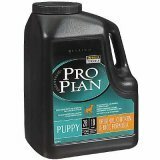 We use the puppy version of Purina Pro Plan until the dog is one year old, and then we switch the adult version. Don't feed canned dog food, and don't give the puppy any human food. You do not need to ration the dry food, or serve small portions of it at certain times of the day... just put out a nice big bowl of dry food and a nice big bowl of water, and the puppy will regulate her own intake. This is called "free feeding". Don't worry... your puppy will NOT get fat from overfeeding as long as all you feed is a dry food. Can't find Purina Pro Plan in your local stores? 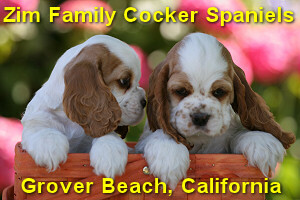 Click here to buy it online and to see other products that I recommend for Cocker Spaniels. If you notice even a single flea on your puppy, run (or drive) to your local pet store and buy some "Advantage". This stuff is SO great... I don't know how we ever got along without it. Don't waste your money on flea sprays, powders, collars, etc. They work about as well in the fight against fleas as Suzanne Somers' "Thighmaster" works in the fight against middle age. But there's an important point to remember when using flea products like Advantage... it's only half the battle. Topical flea products kill the fleas on your pet, but you also need to deal with the fleas that are not yet on your pet! Go to your local hardware store or home improvement store and get some advice on the best ways to kill the fleas in your lawn and inside your home. If you don't do that, you'll just have a whole new set of fleas on your dog in a week or two. One other item I would like to strongly recommend... a television show on The National Geographic Channel called "The Dog Whisperer". This is the best show about dog training that I've ever seen. It's full of great information, and all dog owners should see this! Acutally, it's not about training dogs... it's all about training dog owners to be "the pack leader". If you can't get The National Geographic Channel on your TV, or if you missed the first season of the show... order the DVD and you will learn a lot! If you've got a new puppy in your life, join our Cocker Spaniel Forum and get advice from other Cocker owners who have been in your shoes. Joining the forum is free, and I think you will really enjoy it. We've got over 700 members... and it's the most active Cocker Spaniel forum on the Internet. We have a two-year-old female Cocker and an eleven-month-old male. We have several friends and family members who are interested in a puppy. My question is: is our male dog old enough to breed? I can't seem to find this information anywhere on the Internet. First, you want to allow some time for any major health problems to show up. You don't want to breed a dog with major health issues, and at your male dog's age you might not even realize it yet if he has any. For example, cataracts. They almost never show up at eleven months. The bigger reason has to do with testing to determine if the dog is a carrier for genetic hip diseases. There is a very simple x-ray screening that you can do to determine if the dog has genetic hip dysplasia that might be passed along to the next generation. You have your vet take the x-ray, then you send it off to an organization called the Orthopedic Foundation For Animals and they have their panel of hip experts evaluate it. Again, it takes a while for hip disease to show up... so the OFFA will not do evaluations on any dog younger than two. So, the way it works with most good breeders is that they wait for their dogs to turn two years old, then they have a Veterinary Ophthalmologist do an eye exam to check for any hereditary eye problems which might be passed along to puppies. If the dog passes the eye test, the breeder has their vet do hip x-rays to look for hereditary hip defects. The hip x-rays are sent to the OFFA, and if they get a good evaluation back (and if no other major health problems have cropped up) they then proceed with breeding the dog. Of course, most backyard breeders do not do any of this... and no puppy mills do this... and this is why it is generally much safer to buy a dog from a reputable "hobby" breeder than from a backyard breeder or a pet store. What else have I learned as a breeder of Cocker puppies? 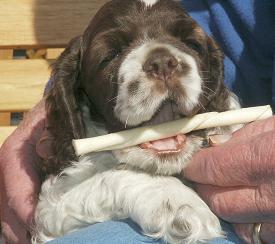 Read my tips on buying a Cocker puppy and my tips on potty training a Cocker puppy. You'll also find some useful information in my list of frequently asked questions.